I had a really fun & busy week! I am excited to see how my little business is progressing, growing, and beginning to evolve. This week I was working on a design project for a local client. They are moving into a new home and needed some help determining how the rooms should be set-up. They are doing some major remodeling, so we went and took a look at the place last weekend. It is coming along really nice, but I can see their dilemma. A couple of the rooms are a little misshapen, so it is not obvious how to use the space in a way that flows and feels good, while also using the space effectively. So, I have been creating a ton of different floor plans to play around with different options. It is really fun to see how you can move one piece of furniture around and completely change the feel of the room around. 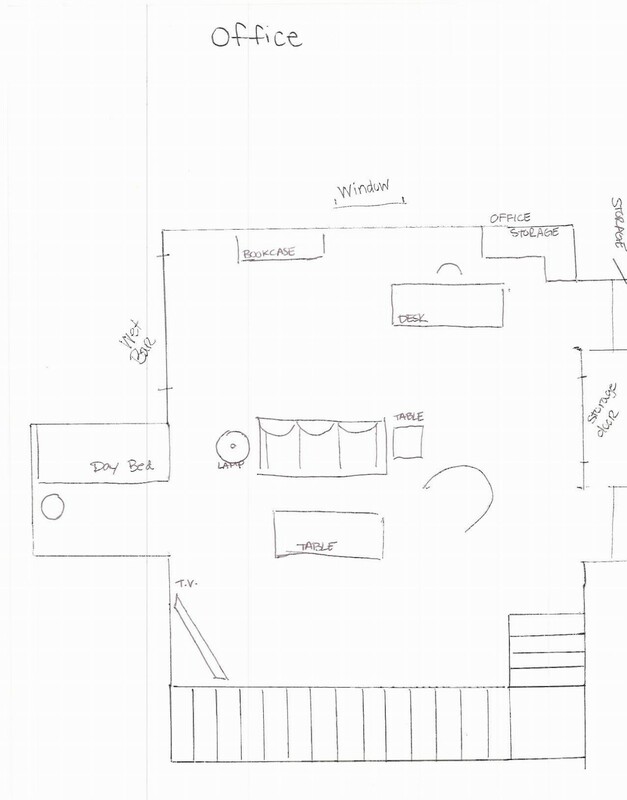 Below is my final layout for the very large bonus room that the client wanted to use as an office, extra guest space (they already have another guest room), and a “hang out” area. I thought about this room the most, as it has a lot of space, but it isn’t obvious where items should go. In my floor plan, I tried to take advantage of the space and make this room as functional as possible. Since you already have a guest bedroom, I would not dedicate this space to that function. I would put a daybed in the large alcove and have the desk facing outward. According to Feng Shui, when seated at the desk, you want to be facing the entrance. If you are not facing out, you would need to put a mirror up to reflect it. Sitting Area – this would be a great place for friends to hang out and relax. Window Alcoves – I would create bookshelves in this space (hard to see in my picture). Hopefully my picture will be better next time. I am testing out programs that draw floor places, so I can start incorporating those into my work. I will keep you updated as this project continues – should be interesting! !